The basic idea behind this work began to take shape in the spring of 1992. At that time, Theodorou worked with the painter Herman Blaut, writing the music for his series of paintings «Paradise has no apple tree». 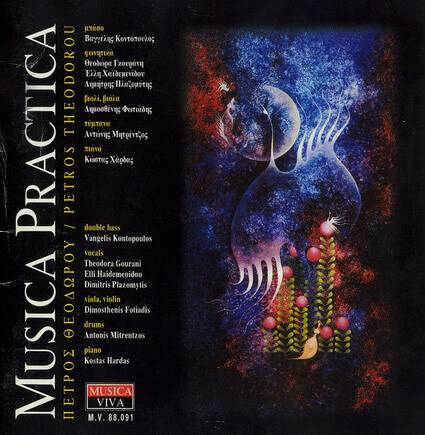 That music is included in this CD (tracks 17-21) under the title «Topos -2 or Paradise has no Apple tree» and it formed the music core of the dance / theatre performance «ISIMERIES». Additionally, «MUSICA PRACTICA» seemed to pave the way for a more personal approach to music technology. With this work he conceptualized his search to relate in a truly creative way the musician and the possibilities offered by the technology of our days. Along with this music he developed his concept of «Musical Praxis» (=»Action»), and created a whole series of pieces with no aesthetic prejudices using electronic sound in many and different between them musical styles. «MUSICA PRACTICA» is actually a live concert for only one musician and his studio on stage. Based on the ideas already mentioned, the work was designed as an «open ended» music material, flexible to be continuously reshaped and refined in time with fresh ideas and additions. When the question of recording this music on CD came up, Theodorou thought to combine in a few cases the sound with acoustic instruments. This was a new goal, to merge the acoustic sound as closely as possible with the electronic one. Not merely from the point of view of sound engineering, but chiefly from aesthetic, structural and compositional aspects. So the already existing pieces were re-builded but always on the same basis that the original «MUSICA PRACTICA» material was grounded on, as electronics remained the principal sound source. If «MUSICA PRACTICA» is for Theodorou an effort to advance what he started with «ONAR» (concerning music technology), this effort goes even further in his next CD, «PHOENISSES». «MUSICA PRACTICA» was formed as I was trying to find a creative and personal approach to music technology, threatened in a way by the recent developments in this field. Countless new devices and possibilities A huge market with its own expediencies and laws A technocratic consumer hysteria from the musician’s part Killing every truly artistic and creative mood. Tools adored as gods replacing the creative motivation. Conceptual and aesthetic musical aspects left apart. By nature I think of myself as not being a pessimistic person. I know very well that all these issues are simply aspects of our times. Their importance for me is just because «I» think them to be important. Tomorrow they may be different, my own perspective may be different, as I believe that nothing is a pre-determined system. At the same time I strongly believe that behind and above any computer and sequencer there is Music awaiting as the ultimate goal for any musician. As a very subtle Art binding our spirit, soul, feelings, experiences, needs, emotions, into the wonderful Musics that fortunately still do exist on our planet. So, as a composer, from the very first moment that I was introduced to the fascinating world of music technology, I tried and try to find a personal way to approach it. And I do not mean just to touch the buttons in my own way or to combine nice synths in clever ways. PLUS, I mean the conceptual and in a wide sense «moral» parts of the whole matter. What do I expect from technology? What am I ready to sacrifice in order to enjoy the new possibilities? How can I practically realize all my musical expectations from this new field? etc. The first serious ideas came when I was working for a series of paintings by Herman Blaut. Forming little by little the concept of «Musical Praxis – Action» I arrived to the first pieces of «MUSICA PRACTICA» which were mainly presented in live concerts for one musician and his studio on stage. (This concept later gave the general title of the whole work). When I decided to gather these pieces in a CD I reworked most of them adding a few acoustic instruments. Anyway, binding together electronic and natural sound was already a fundamental part of my effort to bring together in my own way music technology and Music itself. The pieces of the CD are all very different in style. Their common denominator is not their style but the research direction that gave them birth. It is like trying to give an example that today electronic sound can be used in almost any kind of music. In fact, I believe that once, the term «electronic music» meant an experimental or abstract sound. Later on, a more decorative and technocratic sound environment. In other words, music technology was often trapped either in a sterile and longtime dead academicism or in a mindless, commercial, decorative ambience. The reasons for such a polarity are complex and beyond the purpose of this note. However, my subjective conclusion is that the term «electronic music» is just a label now. It does not, in any way, defining a specific aesthetic or style. It simply denotes the genre of a particular sound source. Music technology as a tool-provider has advanced far enough by now. It may be applied in a great many aesthetic directions, as long as the musician remains free of prejudice, works with enthusiasm and imagination, and does not forget the absolute freedom that’s necessary adjunct to creativity. Thus «MUSICA PRACTICA» consists of very different atmospheres. One piece may be archaic, or oriental; another dedicated to the Legendary Pink Dots; the next may gently mock academic forms that came to an end many years ago but still consist a framework for contemporary works. All these stylistic references may probably be too many «sounds» for just one CD. Yet, it was a great fun to search many areas trying to use each time differently the electronic sound sources. It is like to be one actor trying to play several roles on stage. «…What I have to say today may seem self-evident to music technology specialists. Still, since I have lately been meeting fortunately more and more people who are interested in the subject without declaring themselves as specialists, I seize every opportunity and means of communicating with them. Besides, let’s take my case. I never defined myself as a computer – freak. I am certainly not a specialist in music technology. All my efforts to approach it are rather artistic and not technocratic. In any case, I have always been interested in my music per se, irrespective the tools I use to make it. So it seems a good idea to present today some thoughts which supported this «technological» part of my music. While working on the piece «Topos-2 or paradise has no Apple tree» for a series of paintings by Herman Blaut, I had many ideas about music technology. In order to better organize my thoughts I arbitrarily formed a basis, which all the same arbitrarily I named «Musical Praxis». «Praxis» («action») is a Greek word meaning «the process of doing things, of putting into effect». I see three fundamental points defining the «Musical Praxis – Action» for every musician. These may be the instrument, the musician’s relation to it, and the sound material itself. Furthermore, I think that every «Musical Praxis» of any musician constitutes a unique «role» (pianist, composer, improvisator, etc). So, in the case of music technology, we have to examine these three points. What is really the instrument for a musician using these devices, which is his relationship with this instrument and what sound material has he got in his hands? So music technology basically gives us a new, special «Musical Praxis». Furthermore it provides infinite new roles for the musician, each one with its own demands and distinctive features, depending on how each individual views it. Through this technology the musician can have the chance to be composer, interpreter, and programmer all rolled into one, while manipulating a new virtual instrument with infinite possibilities and creating infinite sound-colors not existing in the real world. And these infinite possibilities can be a major problem if the artist forgets himself as THE decisive catalyst. If he/she gets lost in an endless and charming landscape. Musical contents, forms, compositional as well as aesthetic decisions, creative internal procedures, were and will always be subjects for the artist to deal with, no matter the new perspectives offered by music technology, no matter of what and how many electronic devices can he/she afford. «…People say that every age has had moments when there have sprung up new modes of expression, new movements and new aesthetic theories («new», as compared with the cliches of the present time). Then, as time was running on, what appeared to be «revolutionary» has usually itself become a cliche by the time the next revolution was to occur, and this seems to have been the pattern of development in human civilization up to present day. Supposing this model to be more or less true, I nevertheless think something has changed in the way things evolve nowadays. Through technology and mass media, the polarization that used to exist between what was a cliche and what was revolutionary has come to an end. Just as the very concept of «movements» – ideological, moral or aesthetic – has ceased to have any reason to exist. New ideas and trends do still spring up, to be sure. Yet before these can converge and become a «movement», they tend to disappear into the vast melting pot of an unceasing flow of information. In this amazing complex flow «information» becomes an end in itself and the human capacity for assimilation is violated. As information is stripped of any content and meaning we end up living in an incredibly colorless web of «average» and neutralized meanings. The world around us is surely always sparkling. Still, feelings, sensations, emotions, real needs, our self-consciousness itself, have become leveled and flattened in a monstrous way. We choose not to enjoy them as we HAVE to consume «information» and useless products in nightmarish speeds and quantities. However, I am not saying that the outlook is grim. I merely maintain that a change is taking place in the way our societies evolve. Simply, our value and meaning systems are altering. There is no REASON anymore for «movements» to appear. Polarization between the cliche and the revolutionary is no longer a model of change. In the mean time, it seems that the new guidelines of development have not yet made themselves known. The borderline between «old» and «new» cannot be but ambiguous. This sense of being at a watershed, this lack of definition, is a natural step. Yet, it is hard to stand it. And for the time being I am simply terrified to sense everywhere, around as well inside me myself, the loss of memory, poetry and personal mythology. Electronic sound was once a revolutionary mode of expression. Today I no longer know whether it is still revolutionary or has become already a cliche, since this last part of our age is a great source of confusion and tends to strip every achievement of its significance. One thing is certain, however: electronic sound has become the object of consumerism, like everything else. As «evolution» speeds up not as a natural tendency but just serving consumerism, there is no real human control. Are we ever asked IF and HOW we want this synthesizer’s or that computer’s next model? No, and we ‘ll never be asked as long as manufacturers are designing the «new» in order to sell it and not to serve our creative needs.